If you know me you know I like my lists. So it will come as no surprise that I have lists for when I go away on retreat or seminar. Some items may not apply to a retreat but some do. I like to make a folder so I put all my correspondence for the event in this folder. Basically I keep anything that I think that I might need a paper copy of. I know most of us have smart phone these days and can look it up however I have been in areas where I have had bad cell reception and cannot get anything to pull up on my phone and it saves time because you know exactly where you put it, in your folder. Printed out maps of how to get to your hotel and/or local needlework stores.Now what do I need for seminar? How much stuff you take can depend on how you are getting there. If you have to fly you are limited to what you can take in your “carry-on bag” and what will fit in two checked bags not over 50 lbs each. If you are driving to the event you may have room to bring a little bit more.Let assume we are flying to the venue. So I have 2 checked bags and 1 “carry-on bag”. I like to reserve one bag for clothes and one bag for needlework supplies. The goal is to have everything that you need so you do not have to make miscellaneous purchases that cut into your stash enhancement budget.For Your Bag of Needlework SuppliesI found that when kitting up a project the reusable bags that you use for groceries come in handy. They are big enough that you can fit whole project with plenty of room and have flat bottoms so they can stand up on their own. I like to set one out for each class that I am taking. I take the lists that each teacher has provided and make a copy of it to go in my grocery bag. I then go through the list and check to see if it have it, need to buy it or if it is contained in the usual sewing tools. Items I need for the class will go into each respective bag as I acquire them so that I have everything I need for that class. I doubt that the bags will be very full because most items are covered by usual sewing tools. If the items contained in your bags are not bulky you may be able to flatten them to place them in your suitcase and when you get to your destination take them out and set them up in the bottom of your closet. When you go to class you take that class’ grocery bag and usual sewing tools and you are all set. I like to choose one piece that requires only a few hours work so I could potentially get a finish. I like to take a monochromatic design that uses one thread. I like to take projects that are already started. I like to select projects of different sizes. In this bag go your clothes, shoes, toiletries and medicine. Plan what you are going to wear every day. – Don’t forget to include your traveling days. Grouping all of the items that you need for a particular outfit will help you get a feel everything you need to include in your bag. It may also help you make other clothing choices if you cannot wear the same shoes with most of your outfits. Don’t forget sleepwear. Extra items to consider are a lightweight sweater if the rooms are cold. An umbrella if it rains. A swim suit if the hotel has a pool and you would like to swim. Toiletries – I like to have smaller versions of everything that I use to get ready in a toilet caddy. Include your toothbrush, toothpaste, hair care products, lotion, facial scrub, hair accessories, makeup, deodorant, etc. I wear contacts, so my caddy includes contact lens solution. Medicines – If you have medicine that you take daily basis, do not forget to take them. Make sure that you have enough medicine to cover you for the trip plus 2 days just in case there are delays getting back home. Take a first aid kit that includes some type of pain medication, band aids, anti- bacterial cream, allergy medicine, and some type of antacid. That should cover most of the general ailments out there that you might encounter. The hardest part to this process is making everything fit into suitcases. The comments above are how I get ready to go to a seminar or retreat. I know some of you out there are seasoned pros at packing for retreats and/or seminars. I find that a little planning goes a long way. Some of my methods may not work for you but it may help you put together your own list to help you get ready for retreat and/or seminar without leaving anything behind. If you have ever done a Mirabilia or a Chatelaine design you know the attraction to these designs can be the beading. 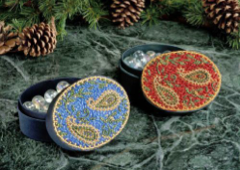 This newsletter article presents 3 ways to attach beads to your piece. Bead is slanted in the direction of your stitch. Use the diagram above as a reference. To start, bring your needle with floss up in position 1 add your bead to your needle with floss. Place your needle in position 2 to go down to complete the bottom half of the stitch. Bring your needle up at position 3 and go over the bead and split you floss if you used 2 strands of thread. Straddle on piece of floss on either side before completing the half stitch by going down in position 4. To start, bring your needle with floss up in position 1 add your bead to your needle with floss. Place your needle in position 2 to go down to complete the bottom half of the stitch. Bring your needle up at position 3, insert you needle into the bead from the bottom going through the bead, and completing the half stitch by going down in position 4. To start, bring your needle with floss up in position 1 add your bead to your needle with floss. Place your needle in position 2 to go down to complete the bottom half of the stitch. Bring your needle up at position 3, insert you needle into the bead from the top going through the bead, and completing the half stitch by going down in position 4. If you would like the bead to blend in with the stitching use a color thread that matches the stitching. If you would like to showcase the beauty of the bead and make it pop off the fabric use a thread color that matches the fabric. Use a tapestry beading needle because these needles tend to be smaller than a regular tapestry needles to get through the beads. They have a ball point end which keeps you from piercing your thread when you stitch. Use 2 strands of thread. Try to avoid using stranded cotton to attach your beads if your piece will see any excessive handling. Use a nylon thread like Nymo or silk floss to attach your beads because either is stronger than cotton. Use a piece of felt, beading mat or Tacky Bob to keep your beads from rolling around on you when you are stitching. If you are like me and happen to be a serial starter, how do you ever finish anything if you are constantly starting new things? Most of the prolific stitchers I know accomplish this by utilizing a rotation. Listed below are some variations on rotation, how you choose to go about it is as personal as the stitcher. I first heard about this technique from Gay Ann Rogers. The idea behind this philosophy is that you select one project as your focus piece and everyday without fail you stitch 12 stitches. Now this method can be modified to use whatever measurement you choose like a length of thread which usually represents 32 stitches or a greater number of stitches but it should be something that is easily accomplished without getting overwhelmed. I find this method works best if you set up a work station in your house where you can leave your piece set up without being disturbed. Each day you stitch your 12 stitches and before you call it a day you do what you need to do to prepare for the next day to just start stitching. So if you know you are going to need more thread to start off tomorrow, you pre-thread your needle the day before so you are ready to start stitching. You do not have to stop at 12 stitches but that is base target for the day. This rotation works by picking 4 focus pieces. Most months have 5 weeks in them so it allows you to stitch on a piece at least once a month. The fifth week does not have a designated project. For that week you can use that week to stitch on whatever you want, give yourself a week off or the chance to fit in a piece that has a dead line. I think this method work well if you have enough variety between you piece to hold your attention. When you finish one of your focus pieces you can choose to start something new or assign work in progress from your stash to that position. This rotation works by picking 5 projects to work on to start. You will need to number all of your projects in rotation and place them in a centralized location or box. For each project you spend 10 hours on it. When you have worked 10 hours on your current project you move to the next project. So when you have gotten to the end of your five projects, you start at project 1 again. When project 5 has 20 hours on it you can choose to start something new or assign work in progress from your stash to the 6th position. So now your rotation has 6 projects. So now some of you smaller projects should be close to being finished and should fall off of your rotation as you complete them. When you finish a project move on to the next project and put in another 10 hours and so on until you get to the end of all of the projects you have in rotation. At the end of a rotation start something new or assign work in progress from your stash to the next position. This is not the definitive list of rotations but they were some of the ones that I have seen in action that tend to get a lot done. Any of these rotations can be modified to suit the stitcher and their personality. The 12 stitches can be modified to 10 minutes a day. The weekly rotation can be made into a daily rotation. The hourly rotation can be shorted to 5 hours. The whole purpose of a rotation is to provide the stitcher with an opportunity to stitch on a given project long enough to show good progress but not long enough for them to get bored with the project or to feel stitching has become a chore. Stitching is a hobby and you are supposed to be having fun without putting undue stress on yourself to get thing done. So if you want start seeing more of you handy work on the walls instead of your closet, a rotation may just be what you need to do it. I recently wanted to kit up a monochromatic pattern that did not provide a whole lot of information on what materials to use. The designer said that you can use any fabric and thread to stitch their design… it is your choice. Just peachy but what did they use to stitch theirs? So let us start with the fabric. 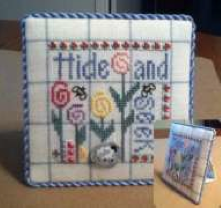 This pattern is a sampler and has a companion piece that goes with it. What I do for one, I want to do for the other. So off to do some research I went. I found the original was stitched on 18 count white Aida using 1 strand of Gentle Arts Sampler Threads (GAST) Briar Rose. I am not a fan of Aida and I do not think that I could handle stitching this piece on 36 count over 2. The pattern’s stitch count is 131 W x 258 H. I want stitch this piece on 28 count over 2 which equivalent to stitching it on 14 count Aida. So to calculate how big a piece of fabric I need I will start with the width measurement. I took 131 (the number of stitches in the width of the pattern) and divided it by 14 to get approximately 9.36. Why 14? Because 14 is the number of stitches in an inch when you stitch on 28 count over 2. I am going to round that up to 10 inches. I like to have a 3 inch border all around so I will add 6 to this measurement to get 16. Now for the height measurement. I took 258 (the number of stitches in the length of the pattern) and divided it by 14 to get approximately 18.43. I am going to round that up to 19 inches. I will add 6 to this measurement for the border to get 25. So if I want to stitch my piece on 28 count I would need a piece of fabric sized 16” x 25”. Now that I have my fabric measurement and count I’ll use them to calculate the amount of thread needed. The one thing I do not want to do is start stitching and run out of thread before the piece is done! While finding more thread may or may not be a problem. I do not want to see a drastic dye lot change on a monochromatic piece. Now you need your thread choices. Are you going to stitch this with DMC Floss, DMC Pearl, Gentle Arts Sampler Threads floss, Weeks Dye Works floss, Valdani, Dinky Dyes silk, or Gloriana? The list could go on and on, and the amount of stitches you will get from each thread will vary greatly. The final piece of information that I will need is a stitch count. I have the stitch dimensions of the piece (131 stitches wide and 258 stitches long). If I take the two dimensions and multiply them together I get the stitch count of the piece if every single stitch is completed … 33,798! The designer did not provide the stitch count of the design so I emailed her and received it – 15,335. Until I got that information I was using an estimate based on her other designs where she did publish the stitch count. I took a sampling of about 10 of her designs and calculated a coverage percentage base on her other designs. They ranged from 38% to 52%. I would have used the top percentage to do my calculation if I had not heard back from the designer. The one assumption that I am going to make is that stitching on 28 count that an 18 inch piece of floss will stitch 35 stitches. I got this number from the Gentle Arts Sampler Thread web site in an article that they have on how to use their floss. 1. N = number of strands in a skein / number of strands used. 3. If you stitch on a different count the 35 used in the above formula will change. GAST estimates the number of stitches an 18″ length of thread will yield on 25 count fabric is 32 (you would substitute “32” for “35” in the formula). 4. Divide your stitch count by the number of stitches per skein to determine how many skeins you will need to buy. One thing to consider: depending on your material choice and the thread you want to use, you may be able to use a more expensive floss for less than some of the cheaper floss options available due to the thread thickness, stitch coverage and skein size! The San Antonio Needlework Guild appreciates the support that our advertisers have given us through the years. 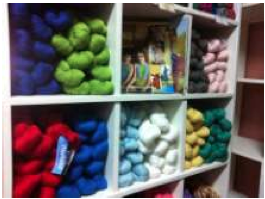 This issue we feature the Yarn Barn. The Yarn Barn opened its doors in 1971 and those doors have been open continuously for over forty years. 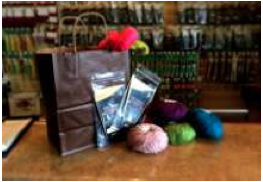 Yarn Barn has been a keynote establishment for the fiber arts in San Antonio, providing an inviting store where novice and experienced knitters, needle pointers, and crocheters come to learn and shop. From the days when Bobbi Ravicz, and Sybil (who remains an icon at the shop) started the shop located at Broadway Central Market through its move to the triangular building at Olmos & McCullough to its current location and ownership by Enid Krueger and her husband Scott, Yarn Barn remains a center of creativity. During my brief time working at the shop, I have been very impressed with the loyalty of many of the customers, some who proudly date their history to the Broadway location, others who are thrilled to find ‘such a wonderful new treasure”. Enid is currently celebrating her second anniversary of ownership and is working hard to remain an important center of resources for textile artists throughout the southwest. If she doesn’t have something needed in stock, she can often order it for her customers. In her two years of ownership Enid has done a lot of refurbishing, restocking, and reemphasizing the stitching side of the business. 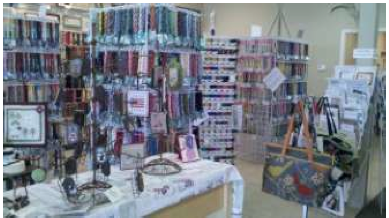 While the shop has long been known for its yarns, Yarn Barn also offers expertise and organizedclasses in knitting, crocheting andneedlepoint. We love to assist our customers with stitch selections, lettering, and giving impromptu instructions instigated by whatever questions drop into our laps during the day. Enid’s goals for the shop include having people see Yarn Barn as a friendly shop where customers are comfortable to ask ‘quick’ questions, get help on tangled stitches while developing their own creativity, and just hang out for the companionship of fellow artisans. For myself (and Enid) some of the best parts of any day include not only the interaction with customers, but watching how their projects progress and helping overcome problems. For myself, I especially enjoy setting up the pretty colors of the yarns and silks, and working with people in choosing the colors and textures for their canvases. One of the unique offerings from Yarn Barn are not only locally dyed and spun wools, but also yarns hand dyed by Enid and Scott, who is also the IT wizard behind the curtain (literally, the office is behind a curtain). 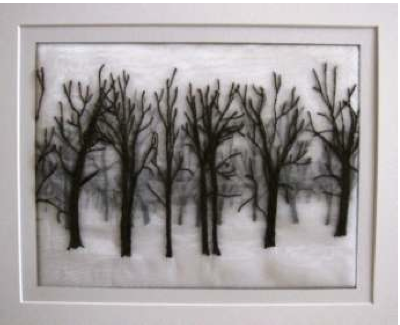 You’ll love seeing the fabulous fibers and hand painted canvases from a wide array of artists. Future plans include more in-depth lessons in different stitches in both knitting and needlepoint and an eventual return to providing spinning and weaving supplies. In the meantime, drop by for browsing & shopping, or just hanging out. The tables are always open, and we have a bang-up open stitch-in on Tuesday evenings. SANG has also been coming in on the second Wednesday mornings taking over one of the rooms and having a typical rowdy time. 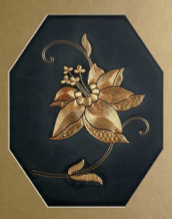 The San Antonio Needlework Guild appreciates the support that our advertisers have given us through the years. This issue we feature Blue Bonnet Studios. I got the opportunity to write about good friends, mentors, as well as small business owners John and Mary Alice Sinton. 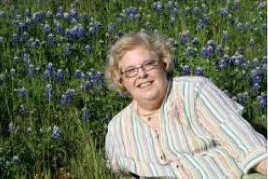 Many of you have met Mary Alice at retreats and EGA functions. Her personality and distinct giggle make her easy to remember but what so many do not realize is beneath the exterior is a savvy business woman. The other half of this dynamic duo is John Sinton, an equally talented artist who has designed and built several tools that Japanese style embroiders use, including the Tomo-dai, which translates to tool table. The Tomo-Dai is designed to keep arms and tools off of delicate silks but they are not just functional, these tables are stunning and are each hand made using exotic hard woods. John also helps with many of the business needs when Mary Alice is traveling and he runs the store during the retreat. The San Antonio Needlework Guild appreciates the support that our advertisers have given us through the years. This issue we interviewed the fabulous ladies of Stitches From the Heart to learn a little bit more about their shop. The store has a reputation for friendliness, whenever they’re open, the stitching table is available to anyone. But you’d have a hard time trying to predict what projects you’ll see being stitched around the table — the customer’s styles and experience levels vary. 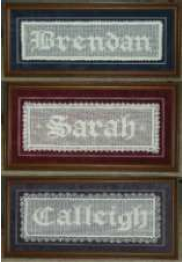 Some of the stitchers work samplers, others simple ornaments, one lady has been known to stitch a Sistine Chapel design (not full size, but darned near!). All are willing to offer tips, give advice on projects, and share some stitching time with anyone who pulls up a (very cushy) seat. Beginners are welcomed and encouraged! 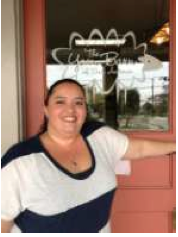 I posed the question “What would you want a new customer to know about your shop?”, in addition to the stitching table, Sharon mentioned that they always fill orders promptly and are a “full service” shop — offering fabric, fiber, framing and finishing. 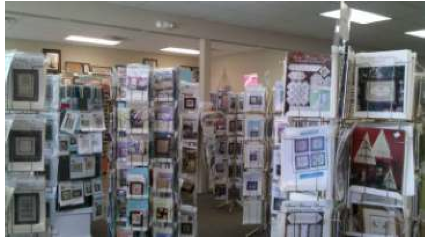 Look around the store and you can see samples of their framing and creative finishes (stand-ups, pillows, ornaments and more). They have a customer loyalty program — after every $150 in purchases, you’ll receive $15 in store credit. The best part – they keep track of everything, no need to keep another card in your wallet! The store has lots of charts, but you’ll notice that most of the charts (except for some perpetual favorites) were published in the last 2 years. (Odds are good that you’ll be able to find Lizzie Kate’s “Time for God” — more than 80 copies have been sold!) many stitching friends and memories you’ll have made. Jackie and Sharon host 3 stitching retreats each year, these retreats are stitching parties! Some of the fun events include door prizes, a white elephant table, both silent and live auctions (watch out, buyers get rowdy). The auctions are fun, but their primary purpose is to keep the price of the retreat lower for everyone. I hear that they broke out tiaras for everyone at the last retreat — a certain princess had a birthday, so her court was also crowned! If you get a chance, they encourage you to sign up for one of the retreats, it’s fun, but also a wonderful time of camaraderie and inspiration! It’s amazing how much you’ll find you’ve accomplished. The San Antonio Needlework Guild appreciates the support that our advertisers have given us through the years. We plan to feature each of our advertisers in upcoming issues. Second in our series is Exclusive Framing. 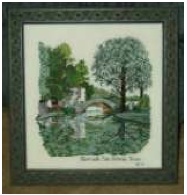 Jennifer Walker has been framing needlework for over 30 years. 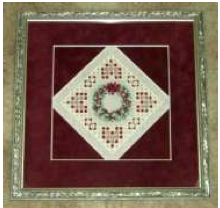 Jennifer is a stitcher herself, so she knows how to properly treat her customer’s work and offer suggestions that will give the finished piece that “wow” factor. All of the framing is done on-site. wasn’t so great for her smallest frame…for a postage stamp. largest collections of crosses available in San Antonio. discount on all Custom Framing Orders. Small Business Saturday only hours: 10-6. 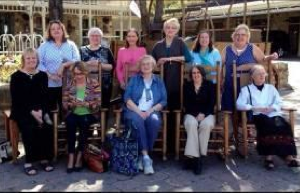 The San Antonio Needlework Guild appreciates the support that our advertisers have given us through the years. We plan to feature each of our advertisers in upcoming issues. 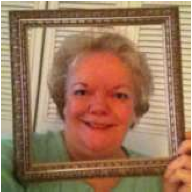 First up is Framing by Carol. 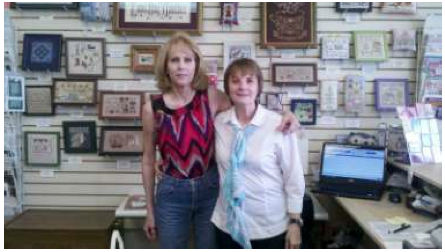 Joan Vanderbrink interviewed Carol Pederson in her home/workshop and discovered some fun facts! I asked Carol what were some of the pieces she framed multiple times due to their popularity. Her response: “Lavender & Lace, Lizzie Kate, and Little House Needleworks all come to mind. The one piece that stands out in my mind is “Time for God” by Lizzie Kate. This was a popular little design that we framed over and over again.” Of course, I was so intrigued that I went to the Lizzie Kate website and looked it up. Next time I go project shopping, it will be at the top of the list. Although Carol has framed countless beautiful needlework pieces, she really can do it all … Carol has even framed a bullet! It was a gag gift for someone who shot himself in the foot so the bullet was immortalized in a paperweight which Carol framed. Carol continues to keep in touch with the people who worked in her shop. She does miss the workers and allher customers since closing the store. She is open for framing on Tuesdays and Saturdays from 10-3. She lives in the Shenandoah subdivision between IH 10 and Vance Jackson. 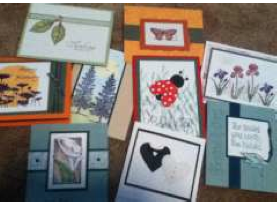 She also enjoys making greeting cards, finishing easel pieces, stand ups, cubes and ornaments. You can get in touch with her through her email CrossStitchPlus@aol.com, like her on Facebook or look for her ad in this newsletter.